Fiber d’Lish is the only Fiber bar that combines natural whole grain oats with a perfect blend of soluble and insoluble fiber. 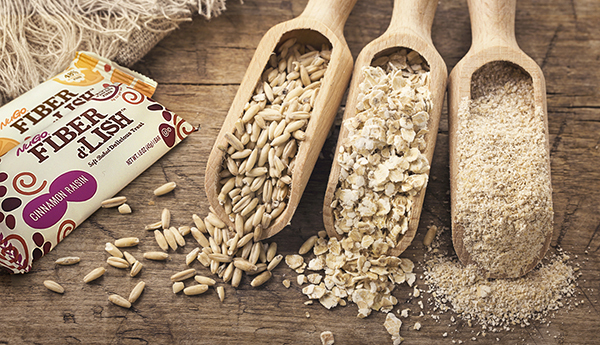 Fiber d’Lish is made up of 7 different types of grains that pack our bars with whole grain “roughage” and contain all parts of the entire grain kernel. This allows us to produce a bar with 12 grams of natural fiber and many nutritious benefits. Read about each grain below and what benefits it provides! Whole Rolled Oats– Is a grain that is commonly eaten for breakfast as oatmeal. Oats are among the healthiest grains on earth. They’re a great source of vitamins, minerals, fiber, and antioxidants. They have also been linked to weight loss, lower blood sugar, and reduced risk of heart disease. Whole Wheat Flour- Is flour made from all parts of the grain that is found in wheat. This includes the outer brown layer that contains the highly nutritious bran and the germ of the wheat grain. Whole wheat flour is a great source of dietary fiber, manganese, and magnesium. Wheat Bran– Is the outer shell of a wheat grain. It is a great source of dietary fiber for preventing colon diseases, cancers, and more. It is also used for treating constipation, irritable bowel syndrome (IBS), high cholesterol, high blood pressure, and type 2 diabetes. Wheat bran helps constipation by speeding up the colon and increasing output and bowel frequency. Organic Kamut Brand Khorasan Wheat– Is ancient wheat, guaranteed under the KAMUT brand to be always grown certified organic, never hybridized or genetically modified and is prized for its nutrition, ease of digestibility, sweet nutty-buttery taste and firm texture. Compared to most modern wheat it has more protein, amino acids, vitamins, and many minerals, especially selenium, zinc and magnesium. Psyllium– Also known as ispaghula, is a form of fiber made from the husks of the Plantago Ovata plant’s seeds. It is a bulk-forming laxative mainly used as a dietary fiber to relieve symptoms of both constipation and mild diarrhea. Flax– Also known as linseed, comes from a blue-flowered plant and helps protect against heart disease, inflammatory disorders, and certain cancers. You can consume it as a whole seed, milled or as oil. It has a mild nutty flavor and adds nutrition and health benefits to a variety of foods including Fiber d’Lish. Millet– Is an ancient grain that is rich in dietary fiber, iron, calcium, and B vitamins. Millet offers more dietary fiber and antioxidants than most other grains. It also releases sugar slowly into the blood and diminishes glucose absorption.